In this day and age; electronic and print media have become the primary means of communication and are increasingly attaining prominence with the passage of time. However, a legion of businesspersons these days is focused on Bulk SMS Services, because of the fewer costs, it entails. SMS Gateway is more preferred these days & has outshone the effective medium of communication. SMS Gateway is a versatile way to send SMS to a legion of people with or without a mobile phone. The mobile user base all over the world is exponentially increasing with each passing day: everyone tends to exploit the power of SMS. Now it is all easy to send text messages directly to an application or a website. To send SMS, it is worth the recommendation to use a dependable SMS gateway. While choosing a Bulk SMS Gateway, it is important to choose one that is guaranteed to generate maximum revenue streams that are easy to access and provide prompt message delivery all over the world. Bulk SMS gateways seem to have changed the mode of communication radically worldwide. SMS Gateway is paired with a range of benefits in addition to keeping the system provider fence sitter. It aids in giving access to one vendor of SMS services while enhancing the fault tolerance and does slightest Cost Routing. It also does great wonders in dealing with the cost and facilitates following the changes according to the demand. SMS Gateway is devoted to developing and delivery of text messaging solutions for businesses . 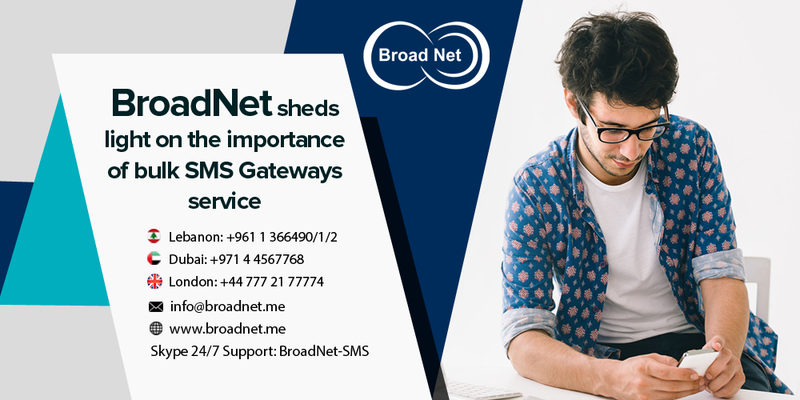 BroadNet is a leading telecommunication provider specializing in bulk messaging services and SMS gateway services that give you a seamless international network. Its innovative software helps you send customized bulk SMS to your overall group with just one click thus offering cutting-edge solutions for sending SMS to group all over the world through a variety of networks gateway. The major goal of any business is to offer bang-up customer service, so they remain contented and trustworthy to the company in the long term. You can exploit the power of services with BroadNet. BroadNet is dedicated to providing you thorough international coverage and interoperability in just one single click. To help stand your business out from others, log on to www.broadnet.me that provides you the best Bulk SMS Gateway services. Get the highest value now!